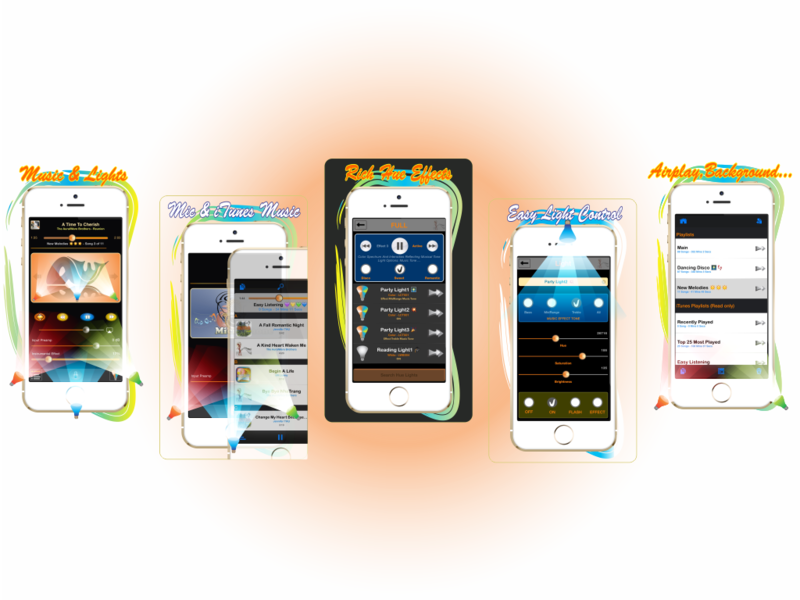 Turn lights (*) into colorful dancing "music" rays syncing with iTunes or surrounded music. This app gives you something that is enchanting and entertaining. (*) Philips Hue Smart LED Lights with supported hardware. › 15 Light Effects including Disco, Sweet and Romantic Mood. › iTunes Library Music Player. › Unlimited User Created Playlists including iTunes Playlists (read only). › Comprehensive User Playlist Features. › Support Music thru Internal or External MIC input. › Background Playing and/or Resuming. › Airplay Ready and Remote Control. › Instrumental Effect for Soothing & Easy Listening. » Due to heavy audio processing, app runs better with IOS 7.x and up, iPhone 4S and up, iPad2 and up, iPod 5 and up OR device processor of type A5 or better. If above requirement are not met, may experience music skipping if playing with light effect on while using other app. » App can not play DRM ( Digital Right Management ) Song or Song resided on iClould or Streaming Music as per Apple Policy and Restriction (iCloud songs require downloading to device before playing). » Lights are Bluetooth or WIFI Smart LED Light Bulbs. Bluetooth SmartBulb requires Bluetooth 4.0 Smart Phone. WIFI Smart Bulb requires WIFI router as hub with 802.11N & 2.4 GHZ. Use WPA/2-PSK Encryption for secured connection. Require IOS 6.x or higher. As many as 50 lights can be used for good music effects. » Lights are Philips Hue Smart Smart LED Lights with supported hardware. The system typically consists of a bridge hardware connected to a WIFI router and hue lights. Visit http://www2.meethue.com for more details.Require IOS 8.x or higher. Although as many as 50 lights can be used for music effect, but due to slow response from Philips Hue Bridge, music & light syncing accuracy is proportional with number of lights used.